April 7-13, 2019, is Volunteer Appreciation Week at Halifax Public Libraries. Throughout Volunteer Appreciation Week, branches of Halifax Public Libraries are hosting Volunteer Appreciation events to say thank you to our generous volunteers. Our volunteers help shape the community we live in, and have a meaningful impact on people’s lives by dedicating their time to support Library programs and services. Here are just a few of our volunteers who go above and beyond in our community. Florence Sassine (blue apron, right) volunteering at a Halifax Public Libraries food program for newcomers. 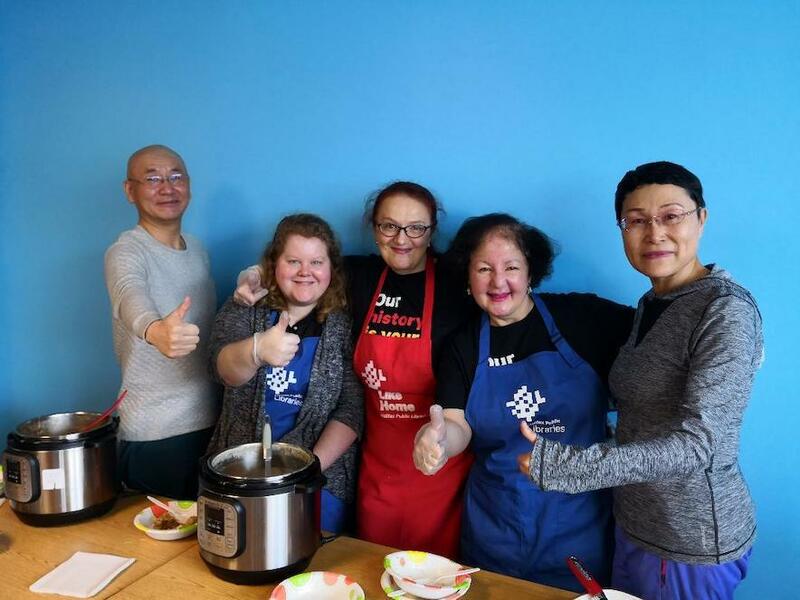 Pictured with Emily Glover, Food Literacy Specialist (blue apron, left), and Tatjana Samardzic, Regional Newcomer Services Library Assistant, (red apron), along with 2 newcomer participants. Florence Sassine’s family immigrated from Lebanon to Nova Scotia in 1966 when she was 8 years old. A volunteer at Library food programs for newcomers, and a tutor with our English Conversation Groups, Florence says public libraries were always a part of her life. Florence mentions the library staff she has had the opportunity to work with are some of the most dedicated and supportive group of people she has met in both her professional career and in her volunteer work. “They excel at what they do and make volunteers understand their importance and value to the organization.” Florence gave a special shout out to Halifax Public Libraries staffperson, Tatjana Samardzic - Regional Newcomer Services Library Assistant; Emily Glover - Food Literacy Specialist; and Vaiva Galinienè - Information and Readers’ Services. Thank you for everything you do in our community, Florence! Qin Zhao (second from left) with English Conversation Groups learners and fellow volunteer, Shilo. 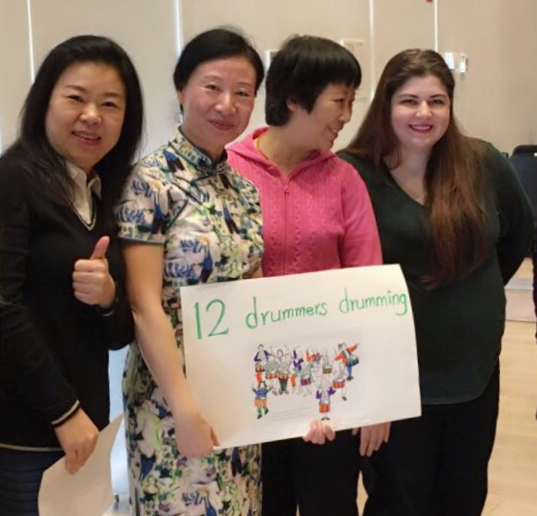 Originally from China, Qin Zhao began attending English Conversation Groups (ECG) as a learner at Halifax Central Library in October 2017 to practice English and learn about Nova Scotia culture. Qin says that this program quickly became the highlight of her week and looked forward to meeting with the group every Thursday. Thanks for volunteering with Halifax Public Libraries, Qin! Wayne Putnam volunteering with the Adult Literacy Program. Wayne Putnam is originally from Truro, and has lived in Halifax since 1975. Wayne has been volunteering with both the English Language Learning program and Adult Literacy program for the past 6 years. 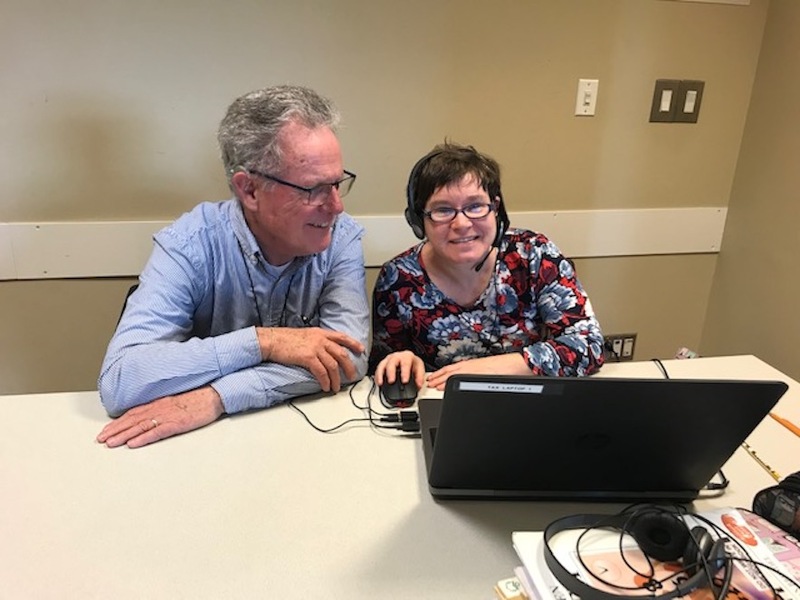 Wayne learned about volunteering with Halifax Public Libraries through a friend and colleague who previously volunteered at the Spring Garden Road Memorial Public Library. We appreciate everything you do for our community, Wayne!